FIFA 18: World Cup Mode is here to satiate all your footballing needs – and the best thing about it is that EA Sports has decided to make it a free update! Yes, FIFA 19 is hovering on the horizon, but that doesn’t mean FIFA 18 is ready to be traded in. In fact, along with a constant flow of FUT updates, EA Canada is planning something special to celebrate the 2018 FIFA World Cup in Russia. 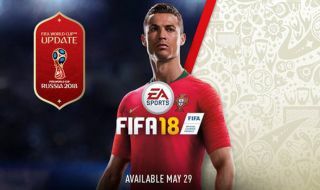 The real-life World Cup 2018 runs from June 14 to July 15, but you’ll be able to download and play the official tournament mode two weeks prior on all the platforms listed above. The release date was officially announced on April 30, with EA confirming that the mode will be arriving on all platforms (yes, that includes Nintendo Switch) on the same day. Unfortunately, the mode won’t be coming to any ‘old-gen’ platforms – sorry, PlayStation 3 and Xbox 360 owners, but it may finally be time to give up the ghost and upgrade. However, owners of the FIFA Mobile app will be getting in on the action, with a special World Cup-themed update arriving on June 6 (although this will be for a limited time, so get playing on the go while you have the chance). The console version of the World Cup mode will feature all 32 of the teams that have qualified for the tournament, including likenesses and names for all the players (although a good chunk of these are already present in FIFA 18). Even the official kits for each national side will be present and correct in virtual form. You’ll also be getting access to the 12 Russian stadia (see below for the full list) that will be used during the real-life tournament, recreated with the same attention to detail and match day presentation you’ve come to expect from the rest of the base game. Even pitch conditions relative to each stadium will be on point. The official match ball will also be included (naturally, can’t have any of this generic nonsense) as will the proper FIFA World Cup trophy, for added authenticity when your team goes on to win the final. The real-life stadia set for the free update are the Saint Petersburg Stadium (Saint Petersburg), Fisht Stadium (Sochi), Ekaterinburg Stadium (Ekaterinburg), Kaza Arena (Kazan), Nizhny Novgorod Stadium (Nizhny Novgorod) Rostov Arena (Rostov-On-Don), Samara Arena (Samara), Mordovia Arena (Saransk), Volgograd Arena (Volgograd), Spartak Stadium (Moscow), Kaliningrad Stadium (Kaliningrad) and Luzhniki Stadium (Moscow). The update will also include some ‘custom cinematics’ to help recreate the atmosphere of the real event, although EA has yet to confirm whether this will include any new animations or fresh commentary (we’d go as far to say it’ll at least have all the official graphics from any upcoming TV broadcasts). So what about all those teams that didn’t make it into the final 32? Well, weep not USA and Chile fans, because plenty of those teams will also be included in the free content update, although you’ll only be able to use them in custom tournaments and friendlies. It’s a nice touch, and one that will keep players in countries who didn’t qualify involved during the heat of the tournament itself. Most of the game modes (with the exception of The Journey: Hunter Returns) are getting some form of update with the new content. These include 2018 FIFA World Cup Russia mode (a tournament setup that will see you duking it out from the group stages to the final), Custom FIFA World Cup Tournament (that aforementioned setup for unqualified nations), FIFA World Cup Kick-Off (supporting offline local player with friends using those official teams, kits and stadia) and FIFA World Cup Ultimate Team (including all the bells and whistles). This being FIFA, there’s also plenty of new themed content coming to the long-term sell that is FIFA Ultimate Team. The World Cup mode patch will include an impressive raft of updates, including a new ‘chemistry system’ that will use a player’s nationality and confederation, rather than their league or club, to determine how they operate in FUT. EA Canada says this will add a fresh yet familiar dimension to how you build and organize your squad. All the qualified players will be present with up-to-date stats, so you can be sure any pack you open will be representative of each player going into this summer’s tournament. Dynamic items will also be present, which will be carefully calibrated over the course of the real-life tournament to ensure they reflect such factors as match day performances and updated stats. Each player will also have a brand-new icon, giving those FUT pack openings a fresh lick of paint. Talking of opening packs, EA Canada will also be running a ‘Double Pack Incentive’, so for every Standard or Premium pack you buy for the World Cup mode you’ll get a pack of the equivalent value in the FIFA 18 base game. On top of this, many of FIFA Ultimate Team’s internal modes will also receive updates of their own. Single Player and Online Tournaments will support all the World Cup mode additions, as will the Single Player and Online Drafts. Finally, the developer will also be updating Squad Building Challenges to keep you updating and reorganizing your World Cup squad over the summer.